Oscar Pistorius first entered the sports world before the 2008 Olympics when the sprinter who was born without fibulae and with two prosthetic legs would attempt to qualify for the Summer Olympics. After competing and dominating in the Paralympics Pistorius would try to become the first double amputee to run in the Olympics. He would not qualify for the 2008 Olympics but his inspirational story was just beginning. 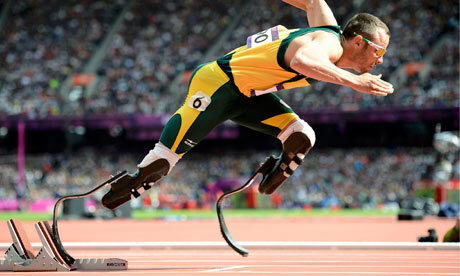 As the London 2012 Olympics approached Pistorius would attempt to qualify once again and this time he would make the cut. Running in the London Olympics Pistorius would make history and would inspire all Olympic fans for his courage to defy all odds and compete with the best in the world despite running with prosthetic legs. He instantly became one of the best stories of the 2012 Olympics and would instantly become an international hero. Then came February 14, 2013 when reports began to surface about the arrest of Pistorius in his home country of South Africa. It was early on the 14th when reports came out that the sprinter had been charged with the murder of his girlfriend, model and lawyer Reeva Steenkamp. Reports stated that Pistorius’s girlfriend had been found shot in the sprinter’s home in Pretoria, South Africa. Pistorius would claim that he believed Reeva Steenkamp to be an intruder in his house and that he shot her thinking he was in danger. With a trial currently underway Pistorius is facing serious charges of premeditated murder while the defence continues to claim a case of mistaken identity. The outcome of the trial has yet to be determined but the damage has been done to the legend and aura of Oscar Pistorius the Bladerunner. Reports of domestic violence have become known and the hero has fallen to be vilified as an abuser and a murderer. The career of this once inspiring man will now forever, despite the outcome of the trial, have a black mark in yet another fall from grace of an idolized athlete. The fall of Oscar Pistorius was the latest, and possibly most tragic, in a long line of athletes that have fallen from grace. Fans both young and old look up to athletes and hold them to a higher standard than the rest of the world. It is a natural reaction to people who are seen on TV at their best every time the lights go on. As fans we are conditioned to see these athletes as better forms of ourselves and naturally we look up to them as an example of how to live. There are the good ones who live their life to help others and treat their spouses and children the way people should. These are not the men and women that everyone talks about though as that is reserved for those athletes who do something inspirational and capture the imaginations of the fans. People like the first black PGA Tour champion, a man who came back from cancer to win 7 Tour de France championships, or a linebacker who overcame the death of his girlfriend and grandmother to finish second in the Heisman Trophy voting. These are the athletes that everyone talks about because they show strength over adversity to come out on top. These are the athletes that are built up to superstar status and in the eyes of many are people to aspire towards. These are also the athletes that have the furthest to fall when something goes wrong and for all of these athletes that is exactly what happened. Whether it is the infidelity of Tiger Woods, the lying and cheating of Lance Armstrong, or the strange story of Manti Te’o all of these athletes have fallen from grace and all in the last five years. Pistorius is just the latest in a long line of sports heroes that have become villains with a history that goes back to OJ Simpson and beyond. It is a sad fact in the sports world that the higher they climb the harder they fall and is seems to be true of every superstar athlete. Sp the question remains if we should continue to build up these athletes or finally realize that these athletes are human and are subject to the same issues that millions of people deal with every day.